Spring is Here! Freezing temperatures, recent snow & pot holes the size of craters, all take their toll on your vehicle. Now Spring is here and it's time to perform your routine maintenance and get prepared for the upcoming summer season. Best Of All It Will Save You Money! Your Total Cost After Discounts is only $129! Includes: Up to 5 quarts of 5W20 or 5W30 oil, quality oil filter, 1 gallon of conventional anti-freeze & 1 pair of standard front wiper blades. 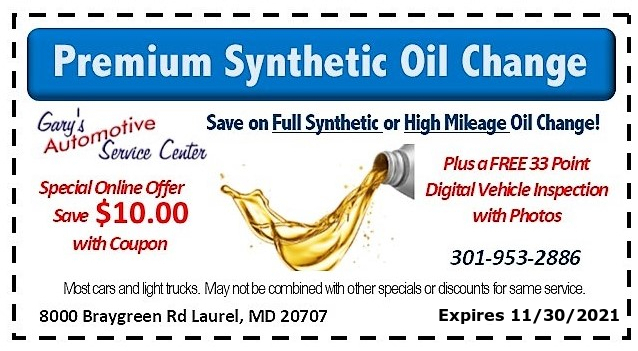 Full Synthetic oil additional. Some vehicles & trucks may be slightly higher. Call (301) 953-2886 now to schedule your appointment or Make Appointment Online. Copyright © 2018 Gary's Automotive. All rights reserved.